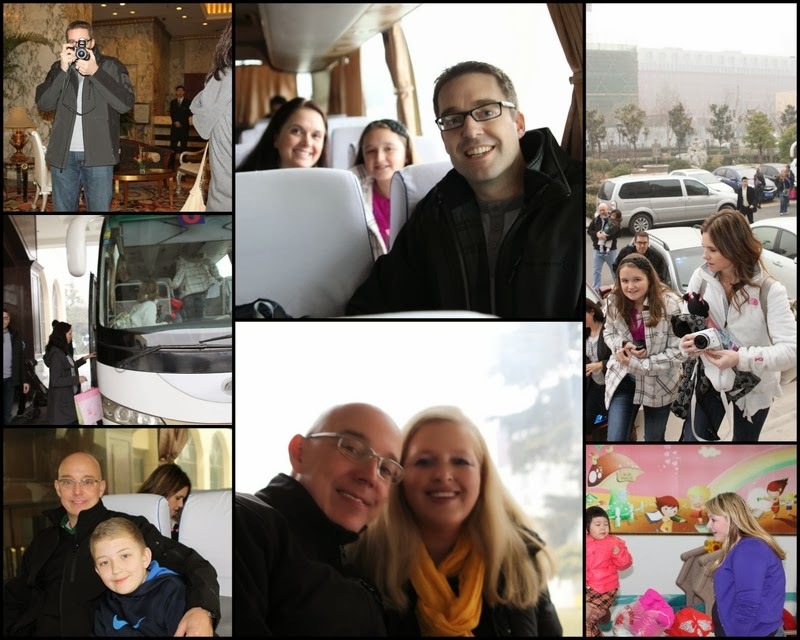 Our trip to Zhengzhou came with a little adventure. After spending the day at the mall and hanging we departed for the airport. Beijing airport is spectacular and finally after waiting 2 hours for our plane to depart we were on our way. The plane ride was uneventful and at 11 p.m. we arrived in Zhengzhou. We picked up our luggage and headed out door to get a taxi to the hotel. Immediately we were swarmed by 20 men or more all saying taxi. We said, "yes, taxi meter." They replied no meter 300 rbm. We thought they were crazy because we paid much less in Beijing for our taxi. We were scared. It was pitch black outside and it was a little foggy fueling the anxiety beginning to rise up in us. We moved away from the men and went inside to see if we could find another solution.They were also trying to get us to use two taxi's because we had so much luggage with us, but we were not going to be split up. We tried to find someone to help us, but could not find anyone who spoke English. We headed back outside and we were then approached by a woman who said she would take us for 200 rbm. We had to use a little blind faith, but the whole ride to our hotel we were afraid we were going to be dropped on some country road and left for dead and our luggage stolen. Thankfully, that was not the case. We arrived at our hotel and unpacked and went to bed. We didn't sleep very well because we were so nervous. Around 7 a.m. we got up showered and went to breakfast. At breakfast we saw all the other families in our group and then went back to our room to gather our belongings to meet Avery. We were greeted by our guide Rita and the bus to take us to the Civil Affairs office. When we got there Stephanie's little girl was there and the tears started rolling for all us mommies. A few minutes went by and I was talking to another mom who I had talked to through Facebook. Then I heard Frank shout she is here that's Avery. We don't know how she got in the building without us seeing her come in, but she was there. We approached her and the her caregivers and immediately she started crying. She didn't want anything to do with us! A couple minutes went by and the director placed her in my arms. She started screaming. I was able to get her to calm down slightly, but when I placed her in Frank's arms she stopped crying. She is a papa's girl. She doesn't want anything to do with me. We are now pack at the hotel and Avery is taking a nap. Later today, we will head out to get something to eat and go to Walmart as we didn't have an opportunity to do so on Sunday. She is so little. She is more like a one year old! She is beautiful and she is our daughter. I can't believe she is in our arms! She is forever ours! So grateful we listened to the whisperings of the Holy Ghost that our family wasn't complete and to think we could have missed all of this. We are so blessed. Wow - so beautiful!! My tears are rolling just reading your beautiful words!! So happy to be part of this journey with you. So touching! I'm sure as overwhelming as it is for you and your family - for little Avery it's all so different. She probably has also never seen a beautiful blond woman before - but I'm sure she will very quickly fall in love with her new mommy!! Sending positive thoughts and prayers your way! Such a beautiful thing you are doing! So sweet! I'm so happy to see another Henan baby going HOME! So happy for you all. May the bonding begin! THe love of a family moves mountains, very quickly. Congratulations! Now you can finally start enjoying her!!!! So happy she is in your arms! I love how they have her in a fancy scarf, just like mama!! Did the pics you sent, show you wearing a scarf? If so, I net they did that purposely! If not what a great coincidence! Congratulations Again, and can't wait to hear how the 1st days go...Blessings! This is such a wonderful time. After all the waiting and the lengthy process she is yours!! Many blessings to your family! Congratulations!!!! I did not go through this as Dave traveled to China but I have seen it happen with so many. Just offer her your unconditional love and as hard as it is, don't let your feelings get hurt. It is about her grief. She will open her heart to you as soon as she can. Things change quickly even though each day she is rejecting you will feel like an eternity. She is darling!!!! Oh wow. One day she will laugh seeing how she screamed at the beginning because she will love you, and you are her mom, and she will be grateful. You are doing an amazing thing! Fantastic - enjoy every minute! Congratulations!!!! Such a special day for you all!!!! Her outfit is one of THE BEST that I have seen yet!!!!! LUV it! Many congrats to you! She is just gorgeous! Such an emotional moment for you all. So funny hag you say Avery is a Papa's Girl. She is gorgeous.